November 30, 2017 – IK Multimedia is pleased to announce the release of MODO BASS® version 1.5, which updates the breakthrough virtual bass instrument for Mac® and PC with new bass models from the most frequent user requests, with more strings, greater range and more control options for an unmatched level of realism and playability. MODO BASS is a customizable physically modeled virtual bass instrument that recreates the sound of the electric bass and how it’s played in real time – from all the physical instrument components, the human technique of how the instrument is played, to the entire signal chain with effects and amplifiers. Unlike traditional sample-based virtual instruments, MODO BASS utilizes modal synthesis technology and a unique sound engine to model each string as a nonlinear sound resonator – the string’s acoustic behavior is determined by its physical parameters as well as by the interaction of the string with fretboard, body and pick-ups of the instrument. The action of the player is then modeled as a nonlinear physical interaction with specific areas on the string surface. Then using IK’s cutting edge analog modeling expertise, the amp and effects rig of the electric bass is added to the sound chain. This gives MODO BASS the ability to create hyper-realistic sound in real time. 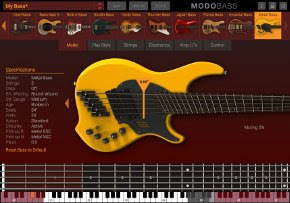 MODO BASS contains a collection of 14 physically modeled iconic electric basses that span the history of bass sound in recorded music – more bass models than available in most other virtual instruments. In MODO BASS version 1.5 there are two new highly sought after bass models. The “Metal Bass,” based on a fanned-fret 5-string model, is particularly suitable for use with the new drop A feature, which allows the lowest note to be tuned from low B to low A, recreating the typical tone loved so much by metal fans. Metal’s variable scale reaches a length of 37 inches for the lowest string allowing for a very deep and solid low end with strong fundamental pitch, but also great focus and articulation to cut through even the heaviest of guitar mixes. The “Imperial Bass,” based on a custom 6-string model, provides an expensive, creamy and rich sound that is ideal for funk, pop, latin-pop, fusion, jazz-rock, alt-rock and many more genres which require a very round, resonant bass tone. Other iconic models in the collection include “60s P-Bass” based on an Alder body 60s bass, “70’s P-Bass” based on an Ash body 70s bass, “70’s J-Bass” based on an Alder body 70s bass; “Modern J-Bass” based on an Ash body 4-string bass, “Devil Bass” based on a 60s single neck pickup bass; “Bass Man 5” based on a modern American 5-string bass; “Rick n’ Bass” based on a 70s 4-string bass; “Studio Bass” based on a modern Japanese 5-string bass; “Violin Bass” based on a 60s German bass, “Thunder Bass” based on a 70s offset body 4-string bass, “Japan Bass” based on Japanese compact 5-string bass, and “Flame Bass” based on a modern German 4-string bass. 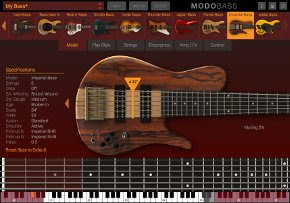 The sounds available with MODO BASS extend far beyond the 14 modeled basses – with the available customization features, users can craft virtually every electric bass sound imaginable. MODO BASS can produce an unmatched and nearly unlimited palette of bass sounds because everything can be customized. IK painstakingly studied and recreated all the factors that affect string tone and performance. Players can choose the number of strings on the bass, the construction type and material of the strings (round or flat wound), the gauge and age, plus the physical action height of above the fretboard. It is possible to choose the number of strings on all the models (4, 5 or 6) to determine the note scale range of the bass. In MODO BASS any 4-string model can be turned into a 5 or 6 string bass at a click of a mouse. The DROP option tunes the lowest string one note lower, bringing it from E to D (or from B to A in the case of a 5 or 6 string setup). Apart from extending the range of the bass, this reduces the tension of the string giving it a unique behavior and tone. DROP tuning is typical in Hard Rock and Metal. There are 24 iconic bass pickups that can be freely interchanged and added to the instrument – up to 2 pickups per bass. Users can change the type of pickups used, neck or bridge single coil or humbuckers, and their physical location under the strings can be moved freely for unlimited playing and tonal variations – a feature virtually impossible with the physical instruments. The electronics can be switched from Passive to Active, and doing so offers access to an additional parametric EQ that allows fine-tuning of the tone for a perfect balance. Players can choose from 3 playing styles – pluck, slap or pick – and control parameters of each style and how they influence the sound. Adjustments can be made to the force applied to the strings, the position of the hand, the direction of the stroke, the fingers used to play the instrument and how the strings are approached, the impact of the thumb slap and the finger pull on the string and even the thickness of the pick and style of its attack. Every aspect of playing style has been modeled as a non-linear interaction with the strings to provide a dynamic, ever-changing sound output. MODO BASS allows full control over the post-instrument signal path as well as including 7 bass stomp boxes and two classic bass amplifiers derived from IK’s AmpliTube flagship software. Stomp box effects include an Octaver, Distortion, Chorus, Compressor, Delay, Envelope Filter or Graphic EQ. Each stomp box gives players full control over the effect applied to the signal, parameter adjustment and overall output volume into the next effect. Also available is a classic all-tube amplifier and 1×15 cabinet, or a solid-state model with a 4×10 cabinet. Adding to the versatility within MODO Bass, there is a new feature that allows users to remap keyswitches or link controls to any MIDI control change. Keyswitching in MODO BASS allows players to create amazingly real techniques like slides and percussive ghost notes. Users can switch on the fly between chord mode and note mode, the type of stroke used for playing, the fingers used and the method of playing in real time. MODO BASS version 1.5 is a free update for registered users. MODO BASS is available now from the IK Multimedia online store for $/€299.99* and a crossgrade is available for $/€199.99** to qualified users. ** Any previous purchase of an IK Multimedia product with a value of $/€99.99 or more qualifies for crossgrade pricing.